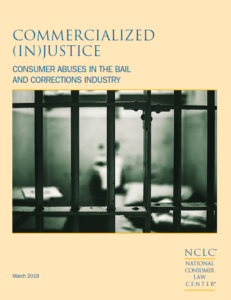 This National Consumer Law Center report examines the growing problem of consumer abuses by private companies profiting from the U.S. criminal legal system and mass incarceration, disproportionately affecting people of color and low-income people, and makes recommendations for reform. NCLC lawsuit challenging New Orleans bail bond companies charging illegal fees and engaging in other abusive practices, in violation of consumer protections. Egana v Blair’s Bail Bonds, Inc.
NCLC’s body of work on the intersection of criminal and consumer law, including reports and free webinars. Since 1980, the number of people incarcerated in America increased from roughly 500,000 to over 2.2 million, and currently 4.5 million people across the nation are on probation or parole. During this time, state and local governments have sought to shift the cost of operating the criminal legal system onto those who have contact with the system and their loved ones, particularly through the assessment of fines and fees on those accused of criminal activity. At the same time, governments (federal, state, and local) have outsourced various core functions of their criminal legal systems—traditionally public services—to private corporations operating to maximize profit for their owners and investors. These trends have led to the growing problem of “commercialized injustice”—consumer abuses perpetuated by private companies profiting from the criminal legal system and mass incarceration. Low-income people entangled with these systems are subjected to costs imposed by private industry at every step in the process. As a result, these individuals and often their loved ones take on onerous debt, trapping many people in poverty. Many of the practices common in the corrections industry violate not only constitutional protections but also federal and state laws designed to protect consumers and ensure fairness in financial marketplaces. The corrections industry pitches itself to states as way to relieve fiscal pressure (created in part through mass incarceration)—but increases costs for individuals. Costs of the criminal legal system are transferred from what previously was borne by government onto the individuals processed through the system and their families, and are further inflated to generate private profits. The commercialized criminal legal system imposes its costs on vulnerable people least able to pay. These individuals are more likely to be people of color, due to discriminatory policing and sentencing practices, and low-income people as economically oppressed communities are frequently targeted by law enforcement. Private companies extract wealth from communities at each step of the correctional system. These steps include pre-arrest diversion programs, bail and pre-trial monitoring, jail and prisons services, and post-incarceration services such as probation and rehabilitation and treatment programs. These commercial transactions push families deeper into poverty and make it harder for people who have interactions with the criminal justice system to get back on their feet. Prohibiting commission payments in all of their forms and requiring that agencies negotiate contracts based on delivering the best value to consumers and providing services in a manner that furthers the public interest. Prohibiting “offender-funded” contracts, and instead aligning companies’ incentives with positive outcomes. Eliminating other conflicts of interest that tie a company’s profits to the financial obligations shouldered by program participants or the length of time individuals remain under supervision. Funding the full cost of the criminal justice system, including services provided by private companies, from government general revenues, rather than extracting it from the often low-income individuals (and their families) processed through the system.